Earn up to $500 for every referral + 10% monthly recurring lifetime commissions. Partner with us and we’ll share what we earn. This is the best hosting affiliate deal you’ll find in the industry. Your earnings are paid in a 60-day conversion window. Refer new subscriptions for a Starter Pro Business 1 Business 2 Business 3 Business 4 Enterprise 1 Enterprise 2 plan each month and have a passive income of $1,350 monthly after 1 year. 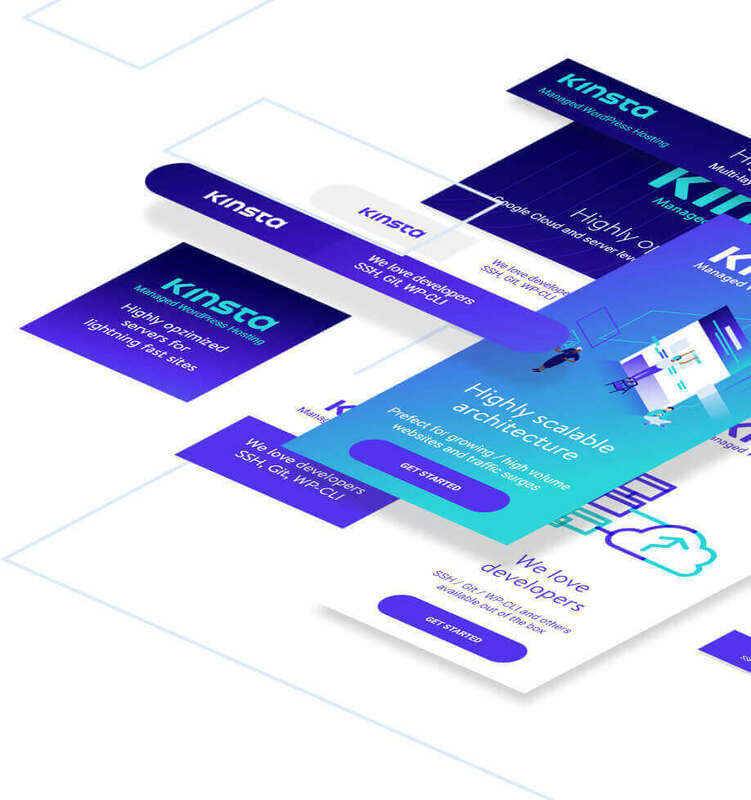 The Kinsta affiliate program complements its high quality of hosting. Equipped with a powerful affiliate dashboard that provides important data points and timely payouts. Join them and start earning with Kinsta today! The beauty behind our profit sharing model is that we truly want you to succeed and there's no limit on the passive income you can earn! We’re here to help. Instead of another confusing and cluttered 3rd-party platform, we’ve built our WordPress hosting affiliate dashboard from the ground up. 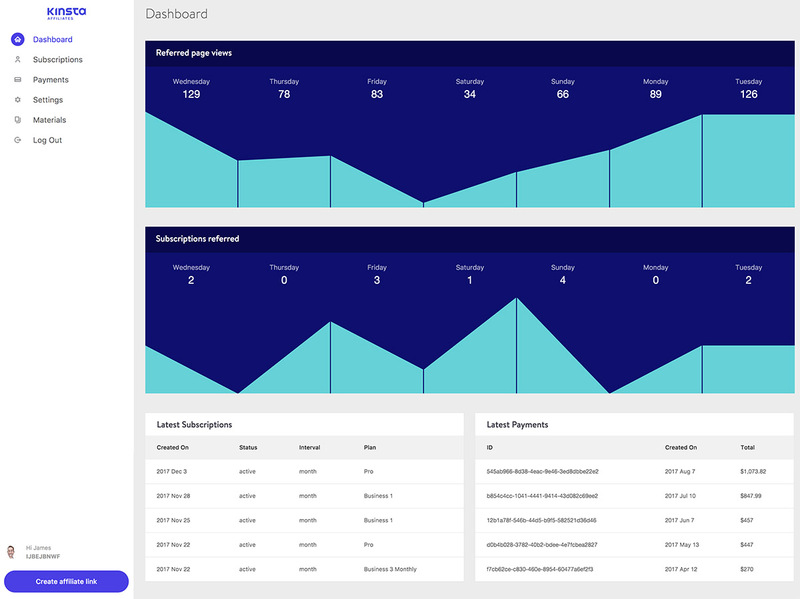 Our dashboard gives you a quick and easy way to see your total referred pageviews, recent referral subscriptions, and a graphical overview of the plan distribution. We stand behind our data and encourage you to double-check with your own measurements. Our system is ITP 2.0 ready. Create your unique affiliate link with a single click and point it anywhere on the Kinsta website. See how your links performs and then optimize based on what converts best. The Kinsta affiliate dashboard is available in five different languages: English, German, French, Spanish, and Italian. More languages are on their way. In your affiliate account you can quickly download banners and promotional materials to use on your site. We already have a wide range of banners in each size with dark or light color sets, and varied wording which emphasizes different features. We want you to have everything you need to help increase your referrals. If you need another size or see something not available just let us know. We have a massive amount of content on our blog where we often discuss marketing and do interviews with some of the big name affiliates in the industry. Get inspired by what they’re doing and start taking action on your own site. We have a talented marketing team and dedicated affiliate support channel here to assist you. We’re happy to answer your questions and provide tips and strategies on ways to take your promotions to the next level. Join our private Facebook group and chat with other affiliate marketers, including the Kinsta team, who are sharing ways to earn more money with WordPress. Discuss what is and isn't working and the best tools to use. The latest supported versions of PHP (5.6, 7, 7.1, 7.2) and HHVM can easily be enabled with a single-click from within the MyKinsta dashboard. This allows you the freedom to run what your third-party plugins need to operate efficiently. A churn rate under 5% tells a lot. Once customers come to Kinsta, they rarely leave. And remember that you earn commissions over the lifetime of their stay!